Everyone should be rightly concerned with North Korea’s recent claim that they conducted a test of a hydrogen bomb, although the claim appears to be exaggerated. Regardless of the type of test conducted, this development destabilizes the region and raises serious questions regarding North Korea’s long term objectives. The UN and America are particularly vocal, seeking to introduce new sanctions to curb Kim Jong Un’s military adventurism, forgetting that it was the United States who created the present belligerent environment. We all know how North and South Korea were created. After World War II, the United Nations split the Korean peninsula along the 38th parallel as a temporary measure, giving trusteeship to the U.S. and USSR until general elections could be held. The unfortunate breakdown of relations between the Soviet Union and the United States, which resulted in the rise of the Cold War, prevented reunification of the two Koreas, and the USSR established a permanent communist government in North Korea. Elections were scheduled for 1947 to allow the two territories to reunite, but the Soviet Union boycotted the proceedings. 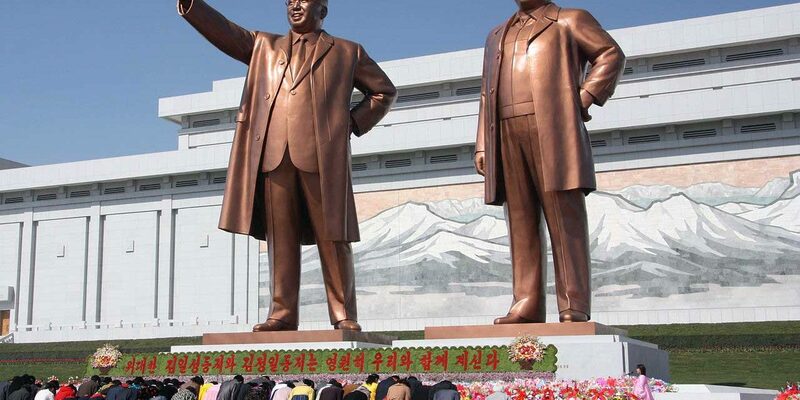 In 1948, Kim Il-sung, who had visions of starting a dynasty, declared the northern part of the country the Democratic People’s Republic of Korea. Predictably, the move was immediately supported by the Soviet Union and China, but not the United States. After three years of ongoing skirmishes and the mistaken belief by the U.S. in the domino theory of communism, in 1950, war finally broke out between the two Koreas. After the war, an uneasy armistice has held the two countries at bay, each supported by opposing ideological regimes. You might think that the evil North Korean regime deserved all it got and everything is its fault. This would be far from the truth. However, tensions between Korea and the United States go back much further in time, and don’t make Uncle Sam look very good. In the mid-19th century, with opium wars raging and gunboat diplomacy the vogue, to protect itself, Korea suspended all trade with the West. In 1866, a U.S. armed merchant vessel visited Korea to promote trade and entered Korean territorial waters without permission. After several days of fighting, the vessel was sunk. Thwarted, in 1871, the U.S. sent warships to Korea in support of a diplomatic delegation to forcibly open trade and establish political relations. When Korea attacked the American warships, the U.S. sent a retaliatory force, known as the Shinmiyangyo expedition. It is not known widely, but from 1958 to 1991 the United States stored nuclear weapons in South Korea for possible use against North Korea. The U.S. took this action by unilaterally breaking part of the Armistice Agreement, despite objections from the United Nations, souring diplomatic efforts to reconcile the two countries. In response to this clear threat and failing to secure help from the Soviet Union, who did not wish to be seen abrogating its Non Proliferation Treaty obligations, North Korea embarking on developing its own nuclear capability. In 1993, the U.S. and North Korea began what many saw as serious talks to limit North Korea’s progress toward achieving a nuclear capability, the U.S. more or less dragged to the negotiation table. In 1994, a successful agreement was reached and North Korea promised to freeze its plutonium enrichment program and replace its reactor with a light water reactor. The U.S. would provide economic aid, supply fuel oil to meet the country’s energy needs, and deliver two replacement reactors. Both sides agreed to move toward full normalization of political and economic relations. It all looked promising, but the deal had fatal flaws. No specific schedule was drawn up to act on the commitments, and the U.S. had no timetable to replaces the North Korean reactor. Moreover, these negotiations did not include South Korea, Japan or China. Soon after the agreement was signed, the Republican Party gained control of the Congress and they did not support the agreement. No getting around political power plays. Despite this setback, North Korea continued to meet its obligations under the agreement and suspended all work on its nuclear program. In 2000, the two countries launched the Agreed Framework Implementation Talks, which were opposed by President Bush in 2001. Sounds like what went on between Israel and the Palestinians. The North Korean regime imposes horrible conditions on its people and is indefensible, but the United States carries a lot of the blame for failing to meet its obligations under successive agreements. After suspending construction of replacement reactors for North Korea, in 2002 the United States released $95 million in aid as part of the Agreed Framework. Asserting that North Korea was developing a uranium enrichment program, President Bush declared North Korea part of the ‘Axis of Evil’. Understandably, that did little to engender a trusting relationship. When dialogue resumed, the U.S. demanded termination of the enrichment program before talks could progress, citing that North Korea was violating its Non-Proliferation Treaty obligations, which is somewhat cute given that the U.S. broke the Armistice Agreement. In December 2002, under U.S. direction, Spanish troops detained a shipment of Scud missiles destined for Yemen, which further strained relations. Everyone in the world is trading in weapons, but North Korea was slapped on the wrist. Late in 2002, deciding that talks with the U.S. were a waste of time, it resumed its nuclear program and expelled all IAEA inspectors, announcing that it was taking these steps in order to provide a deterrent against U.S.’s hostile policy. In 2005, the U.S. finally agreed to resume negotiations, but only after China’s threat to publicly accuse America for its uncompromising hard stance. Later in 2005, relations were further strained when the U.S. accused North Korea of counterfeiting dollars, a claim which was dismissed by the international community. In 2007, a landmark action-for-action agreement was reached, which everyone hoped would finally get things moving. In 2008, North Korea agreed to all U.S. inspection demands—again. Late in 2008, North Korea resumed its nuclear program, citing that the U.S. has failed to deliver promised aid and remove it from the ‘State Sponsors of Terrorism’ list. You might be starting to get the impression that the U.S. has been doing a lot of political posturing for the benefit of the international community, but in reality, never committed to delivering on its promises, and you’d be right. In May 2010, the United States planned to execute land and naval exercises with South Korea in response to the sinking of a South Korean naval vessel, supposedly by a North Korean submarine. These exercises, known as ‘Key Resolve’, were conducted annually and already scheduled. Since that incident, relations with North Korea and the U.S. have steadily worsened. In 2006, North Korea successfully tested an atomic warhead. In 2009 and 2013, further tests were carried out, followed by firing of advanced long-range ballistic missiles. Far from being a rogue state, North Korea has cooperated with the United States to ease tensions and limit its nuclear program, but successive American administrations and partisan Congress politics torpedoed these efforts. What has led to this American aggressive policy by both parties? It has to be far more than the irrational fear of communism. You only have to look at terrible totalitarian regimes the U.S. has supported to stop the alleged spread of communism to realize the U.S. has no interest in fostering democracy. A review of U.S. foreign policy toward countries throughout the world and the post-Cold War Europe highlights a consistent lack of statesmanship, ineffective diplomacy and a disposition to use military force. It’s easier to shoot your adversary than reason with him. Conflicts in the Balkans, Iraq and Afghanistan, epitomize failures by U.S. intelligence services and readiness by all administrations to resort to ‘final solutions’ as a substitute to understanding the nature of conflict in those countries, imposing its Western values on people who hold vastly different beliefs and social structures. A partisan Congress hasn’t exactly helped, torpedoing initiatives which otherwise would have helped achieve a stable, if not a unified, Korean peninsula. Part of the U.S. administration’s problem dealing with North Korea is its entrenched unwillingness to withdraw from South Korea, still pursuing the failed Domino Theory. Of course, it is in South Korea’s interest to have U.S. forces remain there, virtually paying for the country’s defense, allowing it to utilize its resources toward economic development, straining American fiscal position. This is despite the fact that the majority of South Korean citizens would like to see America withdraw its personnel. Despite trying to meet a succession of U.S. demands, failure by American administrations to meet agreed obligations has been a major contributor to ongoing tension and radicalization of the North Korean regime. Fundamentally, North Korea doesn’t really know what America wants from it. It is doubtful the U.S. knows either, preoccupied as it is with factional party infighting. Rather than pursue a serious diplomatic solution, America is again resorting to threats of increased sanctions, which would only serve to confirm to the North Korean leadership the West’s belligerent stance. No one is defending the totalitarian North Korean regime, but a little understanding by the West and application of genuine diplomacy would contribute to healing this running sore. Makes you wonder what the State Department and the CIA are telling the President. Stefan Vucak is an award-winning author of eight sci-fi novels, including With Shadow and Thunder, a 2002 EPPIE finalist, and five political thrillers. He started writing science fiction while still in college, but didn’t get published until 2001. In 2010, he decided to branch out into contemporary political thrillers. His Cry of Eagles won the coveted 2011 Readers’ Favorite silver medal award, and his All the Evils was the 2013 prestigious Eric Hoffer contest finalist and Readers’ Favorite silver medal winner. Strike for Honor won the gold medal. Stefan leveraged a successful career in the Information Technology industry, which took him to the Middle East working on cellphone systems. He applied his IT discipline to create realistic storylines for his books. Writing has been a road of discovery, helping him broaden his horizons. He also spends time as an editor and book reviewer. Stefan lives in Melbourne, Australia. His website is StefanVucak.com. Connect with him on Facebook, Twitter, and LinkedIn.